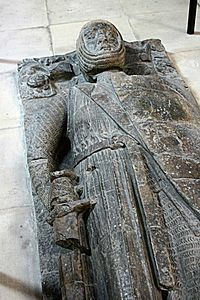 An effigy is a representation of a specific person, especially in the form of sculpture or some other three-dimensional medium. Effigies are common elements in art of the dead. They are usually made of stone or metal and placed on a tomb. Effigy of Elizabeth II by Mary Gillick, used on coins of the UK and several other Commonwealth nations from 1953 until the late 1960s. Welsh children with their Guy Fawkes effigy in November 1962. The sign reads "Penny for the Guy". Effigy Facts for Kids. Kiddle Encyclopedia.